Painting Acrylic on 100% Acid Free Reg Paper | 36" x 18"
Painting Acrylic on Canvas | 47" x 35"
I think childhood is like a garden, it is an enchanted place where the colours are brighter, the air softer and the mornings are always fragrant. Childhood is the creation as well as the recreation of society. Children look up to their elders, try following in their footsteps and do so uniquely. Children communicate with more expressions than words. They fearlessly laugh, cry, dream, and even act. They are an embodiment of innocence although they are equally mischievous and rebellious. I want the world to revive the child within them. The day the world becomes more humane and childlike, I think my art would have fulfilled its motive. 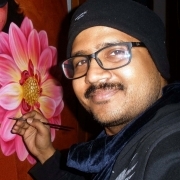 Amarendra Moharana is an artist from Odisha and is currently residing in New Delhi. He graduated with a B.F.A. from Utkal university of culture, Odisha is 2004 and an M.V.A. from Mangalyatan university in Aligarh, UP in 2014. Amarendra’s father is a commercial artist, so his tryst with art began at a very young age and he started painting with oil and watercolours, later as he evolved as an artist, he found his style in acrylics. Hailing from a joint family, Amarendra is inspired by children and that’s a recurrent theme in all of his creations. He has exhibited his work in group shows across New Delhi and Orissa.